As expensive as it is tasty, kobe beef hails from Japan and is the crème de la crème of beef. Kobe beef is perhaps the most expensive gourmet meat on the market today. Imported from Japan, true kobe beef comes from cows raised according to strict protocols. The Japanese strictly regulate how Kobe beef is produced. Kobe beef comes from the Wagyu breed of cattle. Only true Wagyu beef may be called kobe beef. Bulls or virgin cows alone may be slaughtered; any other animal is considered impure. The animals are raised only in the Hyogo Prefecture. From the time they are born until they go to the slaughterhouse, the cattle are only allowed to consume a special grain mixture also raised in the Hyogo Prefecture. According to tradition, they are fed a very special beverage - one bottle of beer each day! Lastly, the animals receive plenty of tender loving care while they live. Farmers brush the cattle daily and massage a blend of sake into their fur. Several slaughterhouses in the Hyogo Prefecture kill the cattle and butcher the meat. The cattle are killed in such a way as to minimize pain and suffering, which is also thought to add to the tenderness of the meat. This particular type of beef is known for its intense marbling. The meat is so marbled, in fact, that it can look almost white. This marbeling effect is caused by fat deposits. The veins of fat create a delectable steak that is unparalleled in tenderness. Prepared by a good chef, this beef has a velvety texture and a tenderness unlike any other beef. The taste has a distinctive tang to it that lingers on the palette like a fine wine. For beef lovers, nothing compares to kobe meat. Because kobe beef is both terrifically expensive and often difficult to get in America, the ever-clever American ranchers developed a beef similar in taste and flavor, but priced far less, than the imported Japanese beef. After the mad cow outbreak in 2001, the U.S. banned Japanese beef imports until 2005, and during that four-year period ranchers were quick to find a replacement for the expensive meat. Black angus cattle, the standard meat producing cattle in America, were crossed with the Japanese Wagyu cattle to produce a beef that so closely resembles the expensive stuff it's hard for anyone but a seasoned gourmet to tell the difference. 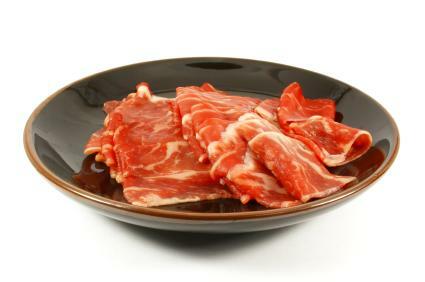 The new meat is marketed as Wagyu beef of Kobe-style beef. Black angus cattle crossed with Wagyu produce kobe-style beef. Can the average person tell the difference between the Japanese import and the American facsimile? Probably not, although many gourmets will argue for the original specialty meat. American Wagyu-beef producers follow the Japanese protocols, including the beer and sake massage, but they do not important the unique grain raised in Japan. Instead they feed a mix of American-raised grain. Critics contend that the different feeds produce a slightly different taste, but to most palates, they are comparable. The overall appearance of Wagyu-style beef is similar, if not identical to true kobe meat, with the same rich white marbling throughout the cuts. Treat kobe meat as if it were a delicate tuna or shark steak, not like a London broil you bought at the grocery store. Use quick-searing techniques to lock in the flavor. It's best served rare to enjoy the tenderness and velvety-smooth texture. Look for thin pieces or have the butcher slice the meat very thin. Use an open-flame grill or a cast iron skillet and quickly sear each thin slice. You must cook it quickly and do not let the fat melt away. This ruins the famous texture. Kobe is never served well done, and chefs will tell you that the rarer the kobe, the better. The Japanese enjoy kobe sashimi, or raw beef prepared and eaten like sushi. Another favorite method to eat kobe in Japan is to slice it paper thin and layer it on top of bowls of steaming hot rice. The heat from the rice alone cooks the meat a bit, but not much. Pair your kobe delight with a robust red wine and a simple side dish like grilled mushrooms and enjoy the feast. You can find kobe beef in gourmet stores and specialty butcher shops.